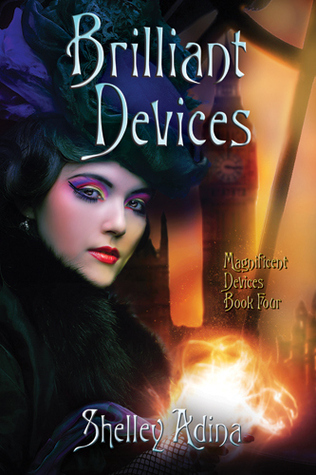 the Magnificent Devices series. Yet readers worry not, there is more! Shelley Adina leaves a very happy footnote that my dear Mopsies will be receiving their own tale! It will occur five years down the timeline after they have been educated in Germany. I was slightly disappointed by the last words of Claire Trevelyan. After three books with cliff hangers, I did not expect the last of the series to include more cliffhangers. Now I will grant that the "series" is not over as the Mopsies take the center stage for the next novel. I do look forward to that and hope there is some clarification from Claire's life as well. I would not be able to forgive Ms. Adina if she doesn't let us know who Claire picked. The rag tag bunch has surprised me with the many twists and turns the story has taken. Just when you think you have come to a logical conclusion about the storyline you hit a hairpin switchback. You have the world of the Bloods mixing with the Wits in a way Claire never quite anticipated could exist. She has learned some very valuable lessons in a very condensed time span; when you suddenly remember the whole series has only stretched six months. That is a rather abrupt introduction to adulthood and I think Claire has handled it triumphantly. There are yet more new characters to keep the story fresh on steaming ever forward. I appreciate the constant introductions. These new characters do not detract from the main heroes of the novel but add a nice depth to the plot. They are not forced in or have pages dedicated to their history to make them feel burdensome. They fit seamlessly into an ever increasing puzzle. I find this writing achievement quite impressive. While I didn't find this to be the best installment, I do look forward to future developments from Shelley Adina. We can't have a winning day, nor do they have to be failures. Some days just are, as this novel just is another published work. Here is to attempting a best seller!